ESN® (Environmentally Smart Nitrogen) is an enhanced efficiency nitrogen (N) fertilizer produced and distributed by Agrium. It is a polymer-coated, controlled-release urea product (often referred to as PCU or CRU), designed to protect against environmental N losses through leaching, volatilization, and denitrification. The polymer membrane encapsulating the urea allows water to diffuse into the granule, creating a urea solution that slowly diffuses into the soil over a longer period of time, so it is promoted as an ideal pre-plant, single-application N fertilizer. The slow-release increases the amount of N available to the crop when it needs it, but reduces the amount of N exposed to loss mechanisms at any given time. Based on these properties, ESN® is marketed to producers as a tool to increase N use efficiency (NUE) while decreasing the number of seasonal fertilizer applications needed, thus reducing supply and labor costs as well as soil compaction that results from multiple applications. Where has ESN® been tested? 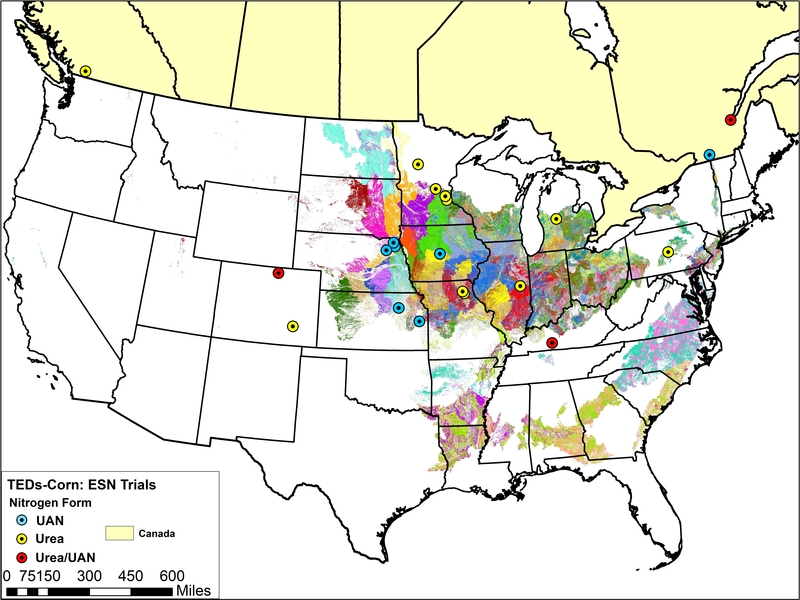 The maps below show trial locations for corn and wheat. The trial locations have been superimposed over the Technology Extrapolation Domains (TED) Framework. The TED Framework is described further on the ESN® and TED Framework page. Based on the research data available from North America, ESN® provides yield benefits over commonly used N fertilizers when applied on corn at the same rate and timing. 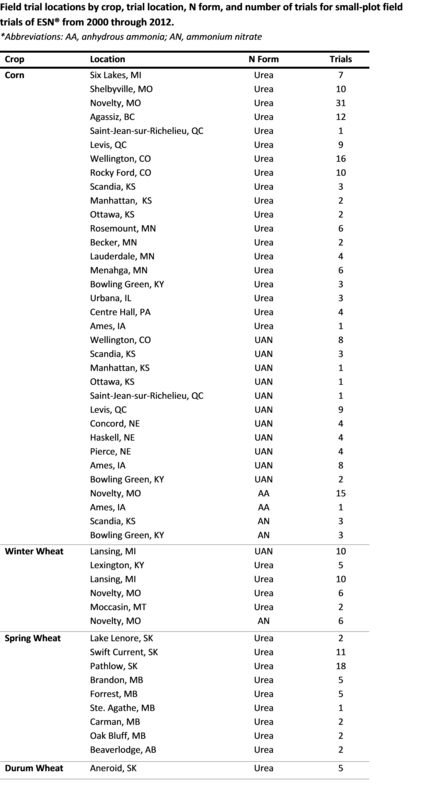 Improved yield in wheat experiments were mostly evident in situations where seed-placed fertilizer urea harmed seedling growth. 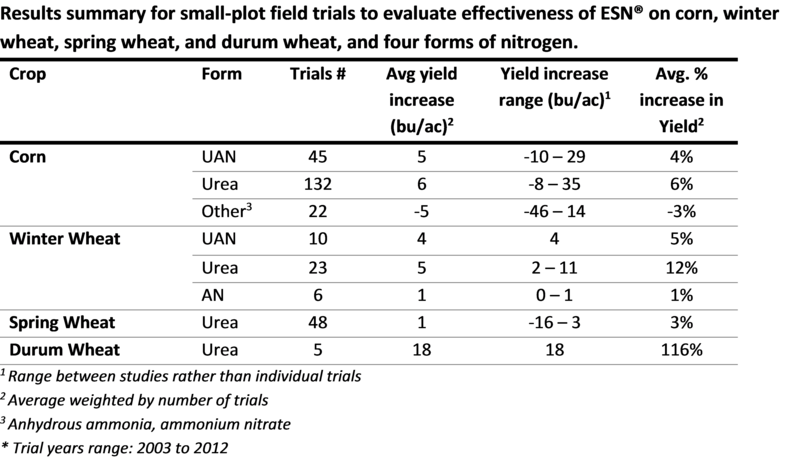 Variability in the data suggests that there may be climate, soil, or cropping system conditions where ESN® is most effective compared to other sources. 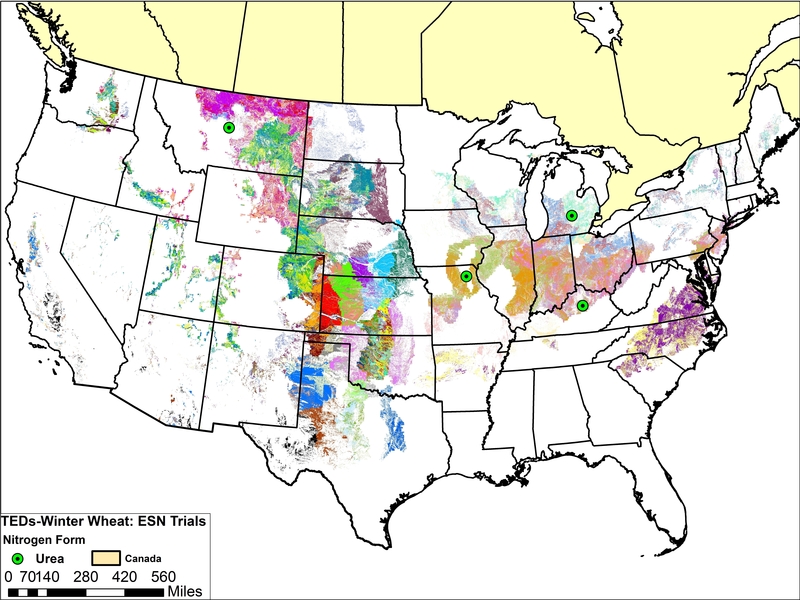 To see if ESN® trial locations are relevant to your operation, visit the ESN® and TED Framework page. To view the complete research report, including references, please visit the ESN® Research Findings page.